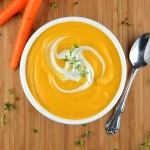 This Gingered Carrot Bisque is an adaptation from the Food52 Vegan Cookbook (you can check out my book review here). I made a few changes based on my personal preferences, but that’s the great thing about recipes…you can use them as a reference and then make them your own. This rich, velvety bisque is not only delicious but it’s pretty healthy too! Onions, celery and ginger saute in a small amount of oil until the onions have softened. 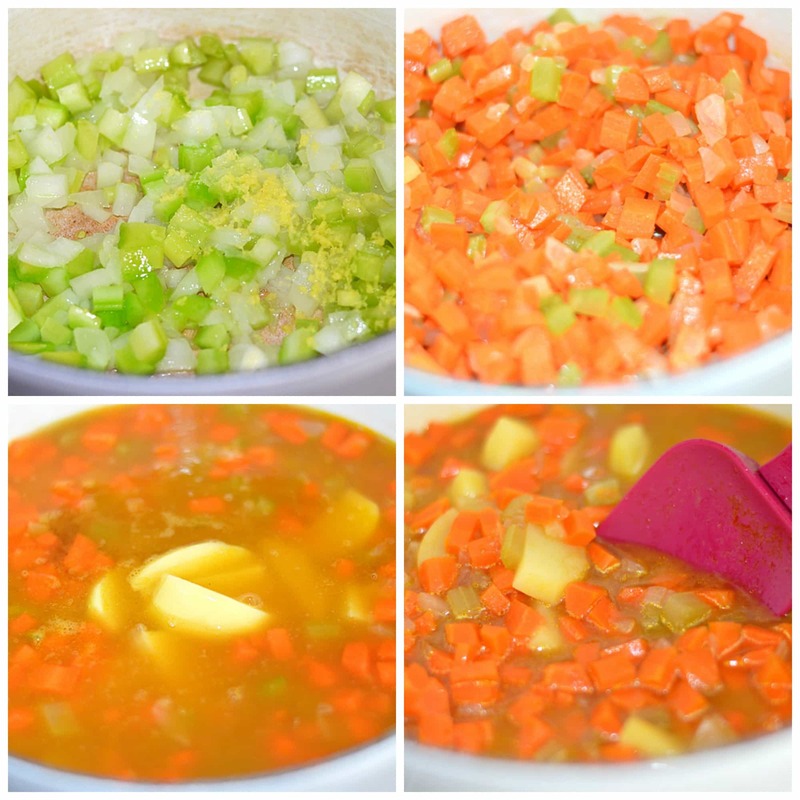 Diced carrots, vegetable broth, potato and spices are added. The potato helps bring everything together when it’s time to puree the bisque. I also found that I needed a bit more of the broth after pureeing. The book calls for curry powder and in general, I am not a fan so that was my first omission. You can see below how the liquid in what would have been a soup, reduces quite substantially. Now it’s time to puree. I use a high-speed blender (such as Vitamix), but it’s important to allow the mixture to cool and blend in batches. Hot liquids expand in the blender and can create a dangerous situation. After pureeing to a completely smooth texture, I return the original pan and reheat. It is at this point that I taste for seasoning and adjust as needed. The finishing touch is a dollop of cashew cream…something that may already be familiar to you. If not, it is as simple as soaking raw unsalted cashews for at least 3 hours in a bowl of water. Drain and add to a high-speed blender with cold water until it is a creamy consistency. Feel free to add a squeeze of lemon and a pinch of salt. I added a large spoonful directly to the soup to create the bisque and reserved the rest for serving. I garnish with sprigs of fresh thyme. Cashew Cream . I used a 6 oz. bag of raw cashews the book calls for 2 C of Cashews, soaked for at least 3 hours, 1-2 Tbl Lemon Juice, 1/2 tsp Salt and 1 C of Water - or more as needed to thin, a pinch of salt, a squeeze of lemon juice and water as needed to achieve a cream consistency). I found I didn't want or need as much of this cream. It was perfect even with less. In a large stock pot, add the oil, onions, celery and grated fresh ginger. Cook until the onions are soft and translucent. Add the carrots, broth, potatoes and curry powder (if using). You could add all kinds of spices here. It just depends on your taste preferences. Cook, stirring occasionally, until the carrots are tender. It took me about 25 minutes. 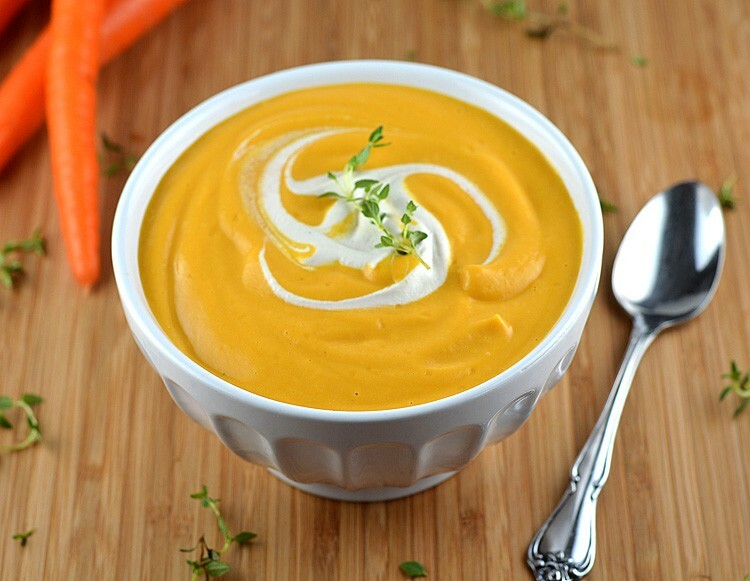 Using an immersion or high speed blender, puree the soup until smooth. IMPORTANT: If using a blender, allow the soup to cool and then puree in batches. Hot liquids expand and can create a dangerous situation in the kitchen. Place the mixture back into the stock pot, reheat and taste for seasoning. I added more salt and pepper at this point along with some of the cashew cream. If it is too thick, add more vegetable broth. Reserve the rest for serving. Garnish with a sprig of thyme and serve warm.